Now you have an opportunity to have a glimpse into their world and uncover the best-kept secrets of the world's most successful communicators. In this program, you will learn the secrets that have been shared only by the fortunate few. 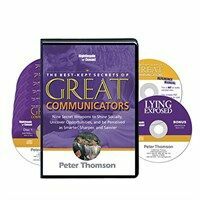 World-renowned communications expert Peter Thomson is not only an incredible communicator himself, but he has also worked with some of the most influential communicators the world over! Based on over 20 years of experience, this program provides you with a multitude of theories, practical tools, and exercises that, if practiced and applied, can make you a much more charismatic and influential communicator.